The 3D screen is impressive and it works but how long can you stand without feeling queasy? Although the Acer Aspire 5738DZG-434G50Mn looks like other machines in Acer's consumer range, it offers an innovative feature that marks it out from any laptop we've seen to date – a screen that offers full 3D images. The 15.6-inch screen itself looks like a regular Super-TFT panel. It's glossy, resulting in reflections in brighter conditions, but brightness and colour reproduction are good. Putting on a pair of polarised spectacles – which are provided in the box – sees the screen change dramatically, however, with all the pixels a lot more noticeable. The icons that looked crisp without them, now look hazy and it's difficult to focus on regular 2D content. To achieve the 3D effect, images are reproduced more than once onscreen. As such, the screen is blurry and unviewable without wearing the glasses, but images combine and appear to jump out of the screen as soon as you out them on. Content made especially for the technology is incredibly realistic, including cartoon videos and photographs. Acer also bundles software to turn your own media content into 3D, but we didn't find this as impressive. While there's no doubt the technology works, impressing everybody who tried the laptop, we found varying side-effects after ten to twenty minutes – from headaches to dizziness and nausea – a result of trying to trick your brain into seeing something that doesn't exist. As a regular laptop, there's plenty on offer here. The mid-range ATi Mobility Radeon HD 4570 graphics card provides enough power for light gaming and running intensive multimedia applications. Everyday office performance isn't quite so impressive, with an Intel Pentium processor used to keep the price down. It's still fine for most uses, however, using dual-cores and 4096MB of memory to make multi-tasking a possibility. Battery life, at 191 minutes, is good enough for most uses, allowing you to take this machine on the road where necessary. In terms of design, it's similar to Acer's existing Aspire models, with a glossy-blue lid and contrasting grey plastics inside, with excellent build quality throughout. The keyboard is large, with clearly defined keys that provide an excellent typing action. The large touchpad also offers great usability. 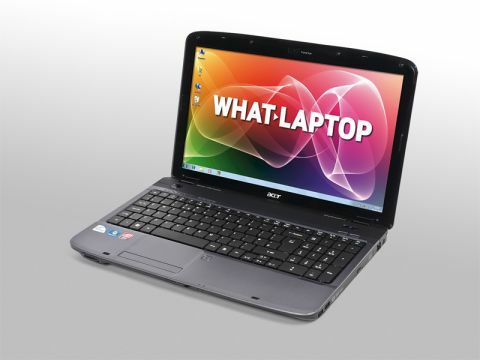 It's impossible not to be impressed by the Aspire 5738DZG-434G50Mn and its 3D display. We were genuinely surprised at just how well the technology works, making movies especially fascinating. However, by also making us feel slightly queasy, it remains to be seen whether changes to the technology can make it more comfortable to view.